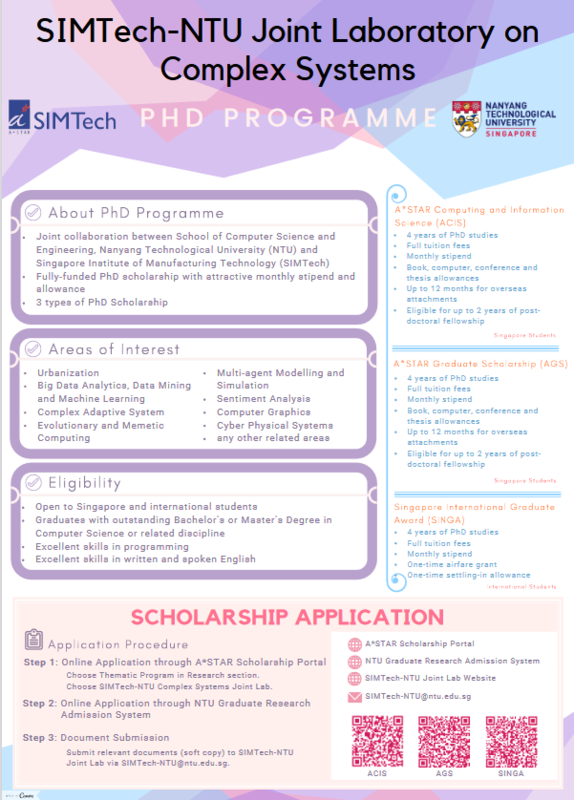 Fully-funded PhD scholarships with very attractive monthly stipend and allowance are available at SIMTech-NTU Joint Laboratory on Complex Systems in School of Computer Science and Engineering, Nanyang Technological University, Singapore. The call for January 2020 applications is now open. Please help us disseminate the announcement to interested graduate students. Kindly refer to the application guideline to assist you in your application procedure. During your application, please remind to choose our Thematic Program as mentioned in Step 1: 8 and 9 from the application guideline.